I. The particulars of its organization, functions and duties. 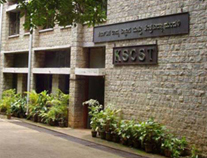 Karnataka State Council for Science and Technology is an autonomous body and registered as a Society under the Karnataka Societies Registration Act, 1960. To identify areas for the application of Science and Technology to the development needs, objectives and goals of Karnataka, and in particular, to the prevailing conditions of backwardness, rural unemployment and poverty. To advise Government on the formulation of policies and measures, including technical, administrative and legal devices, which will promote such application to identified needs, objectives and goals in particular to health, education and manpower utilization with special emphasis on the development of human skills in the rural areas and in the slums and which will promote the scientific management of the natural resources of the State. To promote effective co-ordination and to develop and faster communication and other links between centres of scientific and technological research, Government agencies, farms and industries so that promising Research & Development work is initiated, promoted and effectively deployed in agriculture, in industry, in Government and elsewhere. To initiate, support and co-ordinate applied research programmes in Universities and other institutions in areas identified to be specially suitable for the application of Science and Technology. To prepare Science and Technology plans relevant to the development needs of the State. To consider and advise Government on such other matters as are relevant to the application of Science and Technology to the problems of Karnataka State. The Vice Chancellor, Gulbarga University, Gulbarga. The Chairman, Indian Space Research Organization, Antariksh Bhavan, New BEL Road, Bangalore - 560 094. The Director, National Institute of Technology - Karnataka, Surathkal, Srinivasanagar, Dakshina kannada district. Currently Advisor to the Director for the Challekere Campus of IISc, Indian Institute of Science, Bangalore-560 012. Chairman, Strand Life Sciences Pvt. Ltd.
Government of Karnataka, Vidhana Soudha, Bangalore. New Mehrauli Road, New Delhi - 110 016. Government of Karnataka, Vidhana Soudha, Bangalore - 560 001. Indian Institute Science, Bangalore - 560 012.
c) The Secretary of the State Council is the Principal Executive Officer of the Council. Executive Officer of the Council for implementing all the decisions of the Executive Committee and exercise administrative & financial duties and responsibilities for smooth functioning of day-to-day activities and provide technical support. He will be reporting to the Secretary and Executive Secretary. Conceptualising and formulation of innovative project proposals, providing scientific ideas and technical expertise in furthering the objectives of the Council. Contribute to the team based execution of projects / programmes, and will act as a primary lead with responsibility. Promotes work in a team setting and creates positive work climate. Interacts with R&D, Government & funding agencies for execution of tasks in a timely manner resulting in successful completion of projects. Conceptualising and formulation of project proposals, monitoring and implementation of projects / programmes. Submit progress/ interim / final report to superiors. Provide scientific / technical support to subordinate and Interaction with funding agencies. Assist the superiors in effective implementation of projects and programmes. Any other work assigned by the superiors. Effective maintenance of the State Council Library, documentation of final project reports, annual reports, books & periodical, etc. Assistance in preparation of draft annual report, etc. Any other work assigned by the superiors. Overall in-charge of Establishment and personnel management, formulation of policies, norms, promote HRD, discipline, interpretation of rules/ regulations, assist in holding meetings and co-ordination of offices of Senior Officers, drafting of Agenda / Minutes of selection / Assessment Committee, Maintenance of confidential records, Co-ordination of seminar, workshops, etc. in-charge of accounts and finance issues, attending Purchase Committee, MMR of DST, Executive Committee meetings, etc. Dealing with day-to-day personnel & administrative matters, assistance in formulation of policies of Administration, personnel relations, handling contractual personnel files, Supervision of work of junior administrative staff, interpretation of rules and their application in dealing with personnel / administration matters. Supervision of Inventory of equipments & consumables, its purchases, Building maintenance, etc. Assistance in Financial Planning, finalisation of UCs, budgeting, assistance for statutory auditors, AG, processing of Bills / vouchers, Grants related works, Scrutiny of Bills, filing annual returns with Registrar of Co-operative Societies. Preparation of salary bills, IT related work and any other work assigned by Accounts Officer. Maintenance of documents / registers / files of projects & programmes, grants initial verification and putting up of bills for payments, preparation of salary bill, assisting in auditing & works related to Accounts Department & any other work assigned by the superiors. Maintenance of files, putting up cases to supervisors, Dealing with establishment, personnel / admv. Matters / legal matters, maintenance of service records, etc. & any other work assigned by the superiors. a) Admn-Maintenance of files, putting up cases to supervisors, Dealing with attendance, leave, LTC, grant of incentives, probation period, keeping office record, telephone bills, typing work, etc. Maintenance of project files, putting up cases to supervisors, Dealing with contract appointments, monthly attendances, typing work and job verification etc. Assistance in Inventory management etc. b) Typing, managing the secretariat of Senior Officers, Liaison work, engagement of officers, assistance in holding seminars, symposia. Stores- Contracts management, inventory management, Physical stock verification, maintenance of Mailing List, etc. Inward & Outward dispatch of letters, assisting in physical stock verification, stores maintenance, Misc. typing work, maintenance of files, assisting in holding symposia, seminar, etc. To carryout the task assigned by superiors. The General Body of the State Council is the supreme body headed by the President and followed by three Vice-Presidents and members. The General Body of the Council will review its activities; provide broader frame work and guidelines of its future course of action, which is the responsibility of the Executive Committee for implementation of the same. The administration and management of the affairs and finances of the State Council are conducted by the Executive Committee, which is responsible for smooth functioning of the activities in pursuance of State Council's objectives. Executive Committee shall have the power to make bye-laws not inconsistent with its rules for conduct of the administrative, financial and other affairs of the State Council in furtherance of its objectives and also to amend its rules as and when necessary. It is the responsibility of the Member-Secretary, Executive Committee to implement the decisions taken by the Executive Committee. 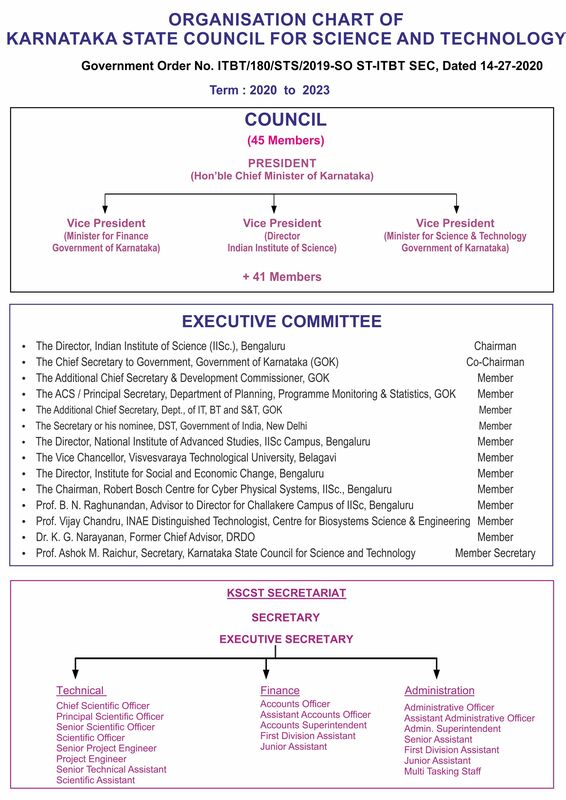 The Member-Secretary, Executive Committee, who is the Principal Executive Officer, is assisted by full-time Officers namely, the Executive Secretary, Administrative Officer and Accounts Officer who are assisted by middle and senior level officers of Scientists, Assistant Accounts Officers, Account Officials and Assistant Administrative Officer. These officers are assisted by secretarial staff. The organization chart of the Council is enclosed. Norms are as detailed in the Memorandum of Association of the Council (Please refer to para (I) cited above). V. The Rules, regulations, instructions, manuals and records, held by it or under its control or used by its employees for discharging its functions. VI. A Statement of the categories of documents that are held by it or under its control. 2. Annual reports regarding activities of the Council. 3. Executive Committee and General Body meetings' agenda and proceedings. 4. Accounts records like cash book, general ledger, etc. VII. The particulars of any arrangement that exists for consultation with, or representation by, the members of the public in relation to the formulation of its policy or implementation thereof. Consultations by students & faculties of professional colleges for initiating studies / research and developmental projects under Student Project Programme. VIII. A statement of the boards, councils, committees and other bodies consisting of two or more persons constituted as its part or for the purpose of its advise, and as to whether meetings of those boards, councils, committees and other bodies are open to the public, or the minutes of such meetings are accessible for public. Chief Scientific Officer and Executive Secretary I/c. XII. The manner of execution of subsidy programs, including the amounts allocated and the details of beneficiaries of such programs. Currently, no subsidy programmes are handled by the Council. Details about the organization and its projects and programmes are updated in the website. XV. The particulars of facilities available to citizens for obtaining information, including the working hours of a library or reading room, if maintained for public use. A Library has been set up for the use of public specifically for academic and student community. Working hours are 9-00 am to 5-30 pm from Monday to Fridays except during general holidays. The general public / student community may obtain information on project reports published under the Student Project Program, & can read publications on science, related journals, books and other reports published by State Council. Council follows General Holidays pattern of Indian Institute of Science.